• The country of Haiti makes up the western one-third of the island of Hispaniola in the Caribbean. Hispanola is between Cuba and Puerto Rico, and the eastern two-thirds of the island is the Dominican Republic. • The capital of Haiti is Port-au-Prince. • Haiti is one of poorest countries in the Western Hemisphere. Eighty percent of residents live in poverty, according to the CIA World Factbook. • Haiti is one of the most densely populated and least developed countries in the Western Hemisphere. • 1492 -- Christopher Columbus lands and names the island Hispaniola. • 1697 -- The Spanish recognizes the French's control of the western third of the island; they name it St.-Domingue. • 1791 -- Slaves rebel against plantation owners; Toussaint L'Ouverture, a former slave, takes control and writes a constitution. • 1799 -- Napoleon I sends an army to restore French rule. • 1803 -- The French army loses. • January 1, 1804 -- Haiti gains independence from France; Haiti is the second oldest independent nation in the Western Hemisphere after the U.S.
• 1804-1915 -- More than 70 dictators rule Haiti. • 1915 -- President Wilson sends U.S. Marines to Haiti to restore order. • 1915-1934 -- The United States occupies Haiti. • 1946 -- Army officers take control of Haiti's government. • 1949 -- Army officers take control of the government again after rioting breaks out. • 1950 -- Paul Magloire, an army officer, is elected president. • 1956 -- Magloire resigns after rioting breaks out; the army takes control of the government again. • 1957 -- François Duvalier, a doctor known as "Papa Doc," is elected president. • 1964 -- Duvalier declares himself president for life and rules as a dictator. • 1971 -- The Haitian Constitution is amended to allow the president to choose his successor; Duvalier chooses his son, Jean-Claude, then 19. • April 1971 -- Duvalier dies, and Jean-Claude declares himself president for life; he uses a secret police force called Tontons Macoutes (bogeymen) to enforce his policies. • 1986 -- Jean-Claude Duvalier flees the country after a revolt; Lt. Gen. Henri Namphy runs the country and tries to get rid of the Tontons Macoutes but fails. • March 1987 -- A new constitution that calls for presidential and national assembly elections by the people is adopted. • November 29, 1987 -- Elections are canceled after terrorist attacks on polling places. • January 1988 -- During the rescheduled vote, the people elect a civilian president and a parliament. • June 1988 -- Namphy overthrows the new government and declares himself president of the military government. • September 1988 -- Officers of the Presidential Guard seize power from Namphy; Lt. Gen. Prosper Avril declares himself president. • March 1990 -- Avril resigns due to protests. • December 1990 -- Jean-Bertrand Aristide wins Haiti's first free election. • July 3, 1993 -- The military government agrees to allow Aristide to return and restore his government by October 30; they later back out of the agreement and do not allow Aristide to return. • September 17, 1994 -- President Clinton sends a delegation to Haiti in hopes of avoiding a military conflict. Former President Carter, Colin L. Powell and Sen. Sam Nunn are among the delegation. The peace deal does prevent an outbreak of fighting. • September 18, 1994 -- The U.S. begins sending troops to Haiti to maintain order. The first 3,000 troops land on September 19 in Port-au-Prince. • October 1994 -- Aristide is restored to power; U.S. troops stay in Haiti to maintain order. The U.N. and OAS boycotts end. Refugees at Guantanamo Bay return to Haiti. • March 1995 -- Most U.S. troops leave Haiti. • Late 1995 -- Rene Preval, a member of Aristide's Lavalas coalition, is elected president. • April 1996 -- The last of U.S. troops leave Haiti. • December 1998 -- U.N. peacekeepers withdraw from Haiti. • November 2000 -- Aristide is elected president again; most other parties boycott the elections, claiming they are fraudulent. • January 2004 -- The terms of most members of Haiti's parliament end, and no new legislative elections are held. • February 2004 -- Rebels and political opposition leaders are opposed to Aristide's leadership and methods and want him to be removed from power. Aristide says he will remain in office until the last day of his term, February 7, 2006. • February 5, 2004 -- Rebels (members of the Gonaives Resistance Front ) seize the northern city of Gonaives and kill four people. • February 8, 2004 -- Looting and violence spread throughout Haiti. • February 10, 2004 -- The death toll from the uprising rises to 42. The looting and violence creates a severe humanitarian crisis. • February 17, 2004 -- The death toll from the uprising hits 50. The rebels control most of the country north of Port-au-Prince. • February 21, 2004 -- An international assessment team with officials from the United States, France, Canada, the Caribbean Community and OAS arrive in Haiti to present Aristide with a peace plan. He accepts the terms of the plan, which include the appointment of a new prime minister, the establishment of a bipartisan Cabinet, the holding of new elections to be overseen by international observers and the disarmament of militias, stationed in much of the north. The opposition leaders say they reject any plan that does not include the immediate resignation of Aristide. • February 22, 2004 -- Rebels attack a police headquarters in Port-au-Prince and release prisoners. • February 23, 2004 -- Fifty U.S. Marines arrive in Haiti to protect the U.S. Embassy and American personnel working there. • February 25, 2004 -- President George W. Bush says the Coast Guard will turn back any Haitians attempting to enter the U.S. and urges the United Nations to compile an international security presence there. • February 26, 2004 -- The United Nations holds an emergency session on the crisis. • February 29, 2004 -- Aristide leaves for the Central African Republic. Supreme Court Chief Justice Boniface Alexandre replaces Aristide as president in a transitional government, as mandated by the Haitian Constitution. • March 2004 -- American and French troops deploy as part of a multinational peacekeeping force. • March 2, 2004 -- Haitian rebel leader Guy Philippe declares himself the country's new police chief and calls for the re-establishment of Haiti's army, which Aristide disbanded in 1991. The U.S. does not recognize Philippe as the head of the Haitian police. • March 3, 2004 -- Prime Minister Yvon Neptune declares a state of emergency in Haiti. Five hundred U.S. Marines are stationed around Port-au-Prince. • March 9, 2004 -- The U.S.-backed Council of Sages names international business consultant Gérard Latortue the prime minister of Haiti. • April 2004 -- The U.N. secretary-general recommends the creation of a multidimensional stabilization operation to assist with the situation in Haiti. The operation is called the United Nations Stabilization Mission in Haiti. • June 2004 -- A U.S.-led multinational force turns over authority in Port-au-Prince to U.N. peacekeepers. • February 7, 2006 - After election scheduling delays and allegations of election fraud, Preval is elected president of Haiti. • February 2007 -- Preval has the force of 8,000 U.N. peacekeepers in Haiti begin an offensive against street gangs in Port-au-Prince. • July 2009 -- Dozens go missing, and at least 15 are killed after a boat carrying more than 200 capsizes near the Turks and Caicos Islands. 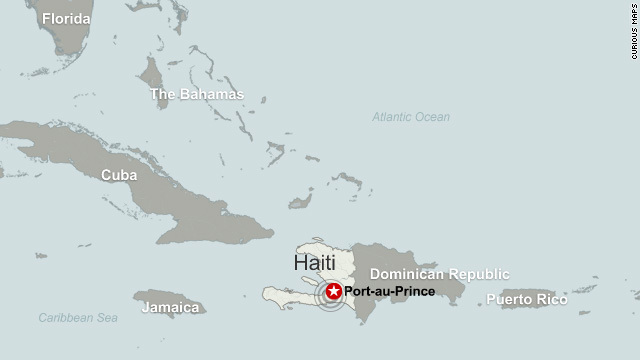 • January 12, 2010 -- A 7.0-magnitude earthquake strikes 14 miles west of Haiti, destroying most of the capital of Port-au-Prince. • January 13, 2010 -- The Red Cross estimates that the quake will affect at least 3 million Haitians. • A president serves as Haiti's head of state. • The people elect the president to a five-year term. • The president appoints a prime minister to serve as head of the government. • A parliament called the National Assembly makes the country's laws. • The upper house, called the Senate, has 27 members, elected by the people to six-year terms. • The lower house, called the Chamber of Deputies, has 83 members, elected to four-year terms. • Haiti is a country in the West Indies. • The Dominican Republic covers eastern Hispaniola. • Most of Haiti is mountainous, and the country's name comes from an Indian word that means high ground.